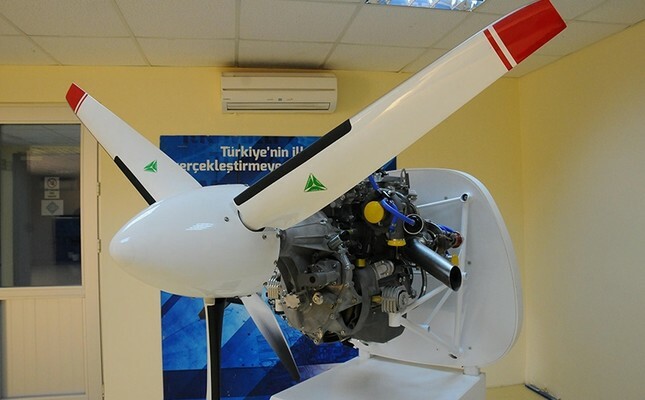 Turkey's first national unmanned aerial vehicle (UAV) engine PD-170, designed and produced by TUSAŞ Engine Industries Inc. (TEI), has received its first requests from abroad. TEI General Manager Mahmut Faruk Akşit said overseas export of the turbo diesel aerospace engine, which was designed for the ANKA drone and made its first flight in December, is on the agenda. "We have received requests from two different countries," he said. Akşit described the product as the "national engine," emphasizing that it was completely developed by TEI engineers over a three-to-four year period and manufactured using supplies made in Turkey, with the exception of a few shelf products. "Our engine is the best of its class. I say this clearly and proudly," he said. The PD-170 engine, developed under the Operative UAV Engine Development Project, is designed for UAVs like Turkey's domestic ANKA – mid-altitude, long-flying drones weighing 1,500-2,000 kilos. Akşit explained that the new engine allows UAVs to perform at a higher level than competitors engines do – enabling drones to see farther and fly longer at current altitudes – thanks to increased horsepower power and exceptional fuel consumption for its power/weight ratio. The PD-170 delivers 170-horsepower at an altitude of 20,000 feet. At a maximum altitude of 40,000 feet, the engine still delivers 90 hp, comparable to competitors' horsepower at 30,000 feet. The engine also consumes less fuel than its competitors, according to Akşit. "At 30,000 feet, it consumes 11 percent less fuel than its best competitor. It allows UAVs to do more useful tasks," he said. According to Akşit, TEI has developed a special vacuum test device that allows engineers to test the engine at -55 degrees Celsius in an environment mimicking 30,000 feet altitude. TEI is looking to decrease dependence on foreign sources while enabling domestic production of engine systems and increasing the percentage of indigenous production in these projects.